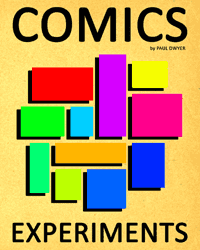 Paul Dwyer, whose Codex Optica was mentioned at this blog a while ago, has a new book out, simply titled Comics Experiments. You can read the whole book in scribd or order a physical book. Comics Experiments is a mix of warped pictures (one description would be dub comics), & out-&-out abstract sequences. Overall, these comics give me a kind of trippy, altered feeling. later note: I should add that some of these stories use high contrast photos which tend to have much more black than white, giving a mysterious atmosphere. Not as abstract as some of Rosaire's, but more abstract than photos taken in daylight.